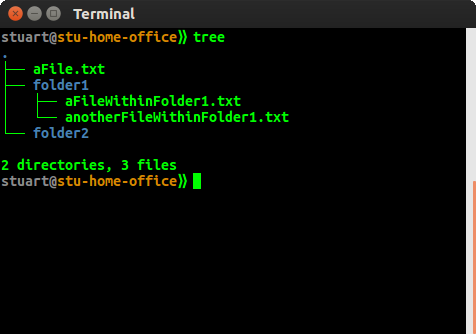 Navigate to the folder you want to show the structure of, and just run the tree command on its own. I'll just list the ones that are probably going to be most useful. By default, hidden files are not shown, if you want to include them add the -a option. If you are working programmatically, you might find JSON output super useful, especially when combined with other options like -h for showing file size. E.g. Use -s if you want the size of the file in bytes, but -h if you want a human readable format that will use K, M, G for kilobytes, megabytes, and gigabytes etc. The previous option was to print the size of the files. If you want to know how big the directory is (size of all files/folders within it recursively), then use the --du option. -l will follow symlinks if they point to directories, not files. Symlinks that result in recursion are avoided when detected. -f prints the full path prefix for each file. -d - only list directories. If you don't want tree to cross into another filesystem from a mount or a symlink, then juse use the -x option, (just like with ncdu).